Like the monster in a horror film, just when I think my artist trading card group is dead... it staggers back to life to give me a few more thrills. Violet was the theme for the July cards. Here are the cards that arrived a few days ago. The one on lower right is what my cards looked like. While in New York last month, I bought myself a holiday present at the Handmade Show at 3rd Ward. A fabulous clock by Richard Birkett! This was one of his more simple clocks, but I just love it. It has typewriter keys, sockets, gears, pieces from kitchen tools and screen doors, regular keys, and a bouncy place to display a favorite picture. Richard doesn't seem to have a website or blog, but I did find a couple more of his clocks here. He lives in Otego, N.Y. Here are the postcards I received from the swap that I participated in... there was no theme. What a great variety of styles and techniques! Here are the Yellow Trading Cards that I got back in the swap that we had for January. It is a rather interesting mix, I think. The bottom two on the right are the extra Yellow cards that I made. Here are the cards that I received in the "Window to my Soul" themed swap. I did the one on the upper left. As I mentioned earlier, I was thinking window to my world when I made it, not soul. But TV is probably an honest window now that I think about it...I certainly spend enough time staring at one....it may have taken over my soul. My favorite of the bunch is "Window to my Sole" on the bottom right. HA! I wish I had thought of that! Here are the cards I got back from the "Layers" swap. I made the one on the upper right, which I called "Layers of Layers". As you can see, just about all variations of layers are present... layered fibers, layered colors, layers of generations, layers of eggs and layer cake. Pretty fun! The July theme for the Artist Trading Card swap that I am participating in was "Fireworks". Here are the cards that I have gotten back so far. The one in the upper right corner is my card. The blob in the lower right is my toe. Here are the cards that I received back from the latest swap. The theme was "May Flowers". (I made the card on the upper right.) Hope all the Fathers out there had a pleasant day yesterday! I had a long, mostly quiet day exhibit sitting at the local art guild's all member show. I'll post some pictures of it next time. Here are the artist trading cards I got back in the "My Backyard" swap! They are all so different. But you know...I bet if we really looked at pictures of our backyards, there wouldn't be a whole lot of difference. Its all in how you look at it, right? 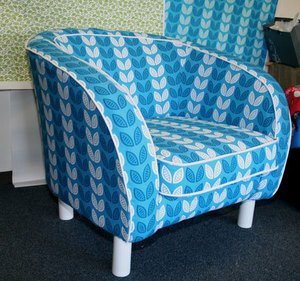 She also did another chair in a large black and white floral print that can be seen here. Not bad for a $3 Goodwill find! A while back, I saw a chair that had been put out in the trash for the garbage guys to pick up. It was in front of a house that I had to drive by several times in the course of the two days before trash pickup, and finally, I just had to stop and put the poor thing in my car. It has such great "bones"! 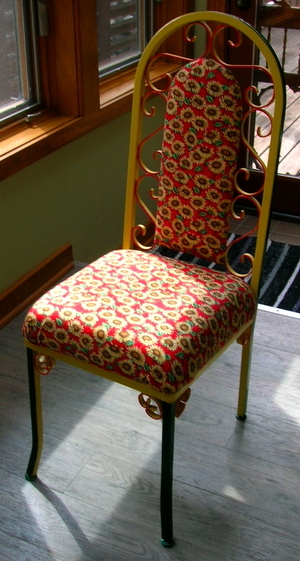 It had these curly metal elements that made it look like patio furniture, but it also had an upholstered seat and back, which made it seem like an indoor chair. The upholstery was beyond dirty, but both the seat and the back were easy to remove and recover. I spray painted the metal frame a bright yellow, and they did some shaky hand painting in green and red. 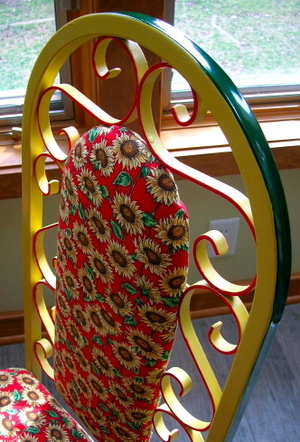 I have a poster from Israel that features brightly colored "curly" chairs, and I thought that this chair would look good sitting in front of that poster. It would be a fabulous decorator accent, not a single chair that didn't match anything else in the house. Well, somehow, the look just wasn't what I hoped for. The chair was nice looking in a gaudy sort of way, but it didn't "draw your eye" to the poster. But it is a nice addition to my newly yellow painted room. I collected large amounts of that Hoffman Sunflower fabric in a variety of colorways back in the day....thinking I'd do a "Sunflower" room someday. It could still happen. Way, way back in the end of 2007, I saw a plea for a few more participants in a "Skinny Book" swap hosted by Chrysti at the Altered Abbey. Chrysti had two swaps going. In the first one each person was to send in 26 skinny pages (4 by 8 inches)and each page was to be an original work. The second swap required 26 skinny pages, but the pages could be reproductions, or copies of one original work. I signed up for the reproduction swap, because I wasn't that sure of my page making abilities....and because time was short. Chrysti was out of touch due to the holidays when I finally made my decision to sign up, and the deadline for sending the pages came before she was going to be able to respond to my request to be a part of the fun. So, I just went ahead and made 26 individually created pages, but they were all very similar. (I posted pictures of some of them previously.) Well! 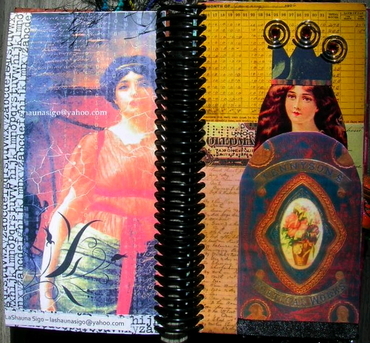 Chrysti was kind enough to put me into the All Original swap, the book I got back is FABULOUS! 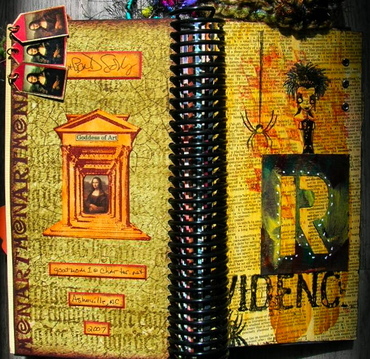 Chrysti made the covers and bound each book. No small task! As you can see, many participants embellished their pages with yarns and fibers. 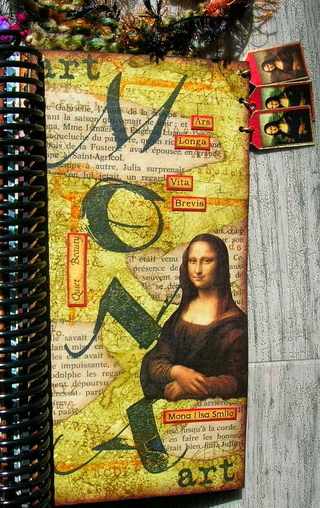 Many pages have pockets and tags and three dimensional elements. Here is an extra fabulous page made by someone who has a beautiful signature...that unfortunately I can't read. Check out those three tiny "Mona tags attached to the upper right corner! All of the pages in this book are so cool. My page looks pretty plain in comparison, but my excuse is that it was made for an easier swap. Thank you, thank you Chrysti! This book is a treasure! On my third try at swapping Artists' Trading Cards, I finally got some back! There are always nearly always some kinks in group projects, even though everyone means well. 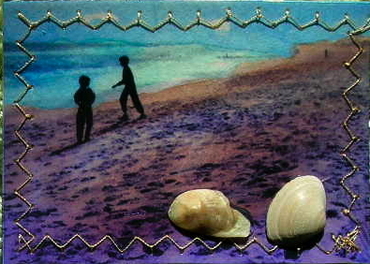 The theme for this swap was "Beaches" and these ATCs fit the theme perfectly. It was a lot of fun to forget the ice and snow and cold to work on these cards and I appreciate the opportunity. My thanks to everyone who made this swap possible. Nice work everyone! Check out the quilt rack that my brother made for me! It is the second one he has given me. 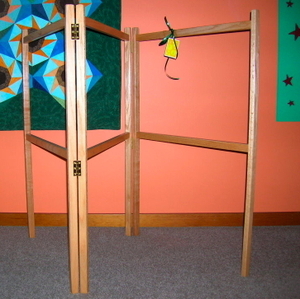 The first one is just like this one, but about twice as tall. Thank you Jim! Don't be fooled by the bad camera work- the legs are very straight. I have GOT to learn how to use my husband's big fancy camera. My little simple camera is so quick to "fish eye" photos. Later today I am going into Kansas City to hear Judith Trager give a talk on the Front Range Contemporary Quilters exhibit at the KC Main Public Library My hat is off to the members of Front Range...they are a VERY talented group! I think blogs have taken the place of magazines in my life. It can be a relaxing treat to "thumb" through all of the beautiful, seemingly endless pages of photos and thoughts posted by creative folks from all over the world. It was while bouncing around in blog world that I came across Jennifer Conway, who lives in Canada. 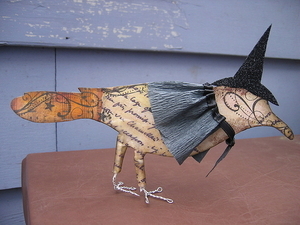 She has an Etsy Shop where she sells collaged and beeswaxed items, including very cool crows and frig magnets. 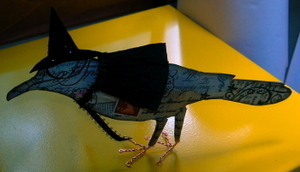 Here is a photo of one of her crows that I borrowed from her Flikr site. Some of her crows have top hats, and some have clown hats. I think she is doing them on commission now, since they fly off out of her Etsy shop so fast. I smile every time I look at this gal... she has a glamorous glittery hat, and a stylish crepe paper cape... I just love her intent stance. Thank you www. I never would have found Jennifer and her crows without your help! Okay, I swear I will move on and do something else! Making nap quilts for a local Head Start Class is so easy and fun, but enough is enough. 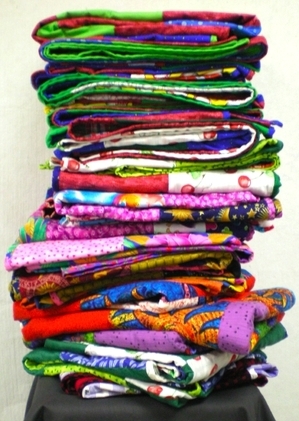 I'm not even sure how many are needed, but I have made twenty-and I'm not the only one sewing on this project. Time to work on something a bit more challenging. Monday I spoke at the Konza Prairie Quilters Guild in Manhattan, Kansas. What a great group! The show and tell was enough to make me wonder just what I could add to their expertise. We had a good time visiting and making Artist Trading Cards. I'm just sorry I forgot to bring my camera....so you'll just have to imagine the fun we had. Last Thursday evening we had the opening reception for Kansas Art Quilters newest traveling exhibit "Altered Views". It was a very pleasant event! The folks that manage the Irene B. French Gallery in Merriam are great! Last Saturday we planned to take the bus to the "quaint port village" of Lyttelton. They had advertised a farmers' market and a flea market in the paper, and we thought we'd check it all out. Well, Saturday was gray and rainy, so we decided to skip that part of the day and go directly to the Artist Open Studio Day at the Christchurch Arts Center. 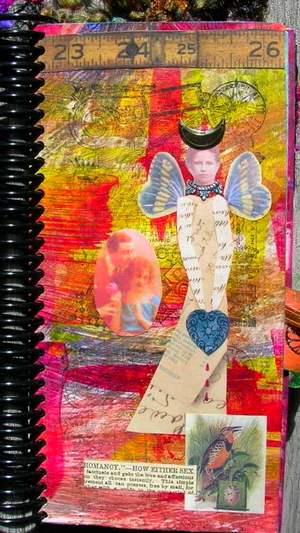 Jeannette DeNicolis Meyer has been an artist in residence there for the month of April. 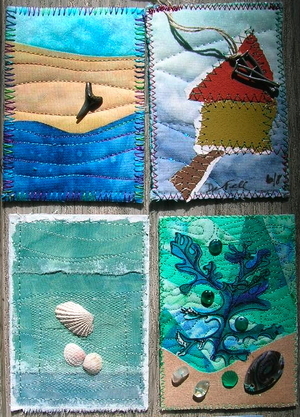 Jeannette is a talented textile artist and a great teacher. I was lucky enough to take a discharge class with her at QSDS last summer. I took a couple of pictures of Jeannette in her studio here, but I won't post them because I am afraid that I did not do her and her work justice. But check out her work, it is inspirational. Sunday, then, we did head to Lyttelton. No markets, but a much nicer day. We strolled up and down the streets and enjoyed the harbor history and scenery. One sudden surprise was this cardboard box robot guarding a loading dock at the end of a short alley. Look closely, there is a tiny second robot in the big robot's tummy! Very cute. 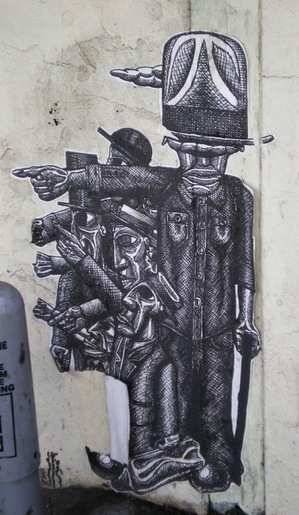 Then later, we saw a new thought on graffiti. Someone had drawn or drawn and then printed out these great pointing guys on paper, and then pasted the paper on the wall. A good way to get finely detailed tagging produced in the safety of your home and reduce exposure to the law enforcement folks with just a quick smear of glue. Part of it is starting to peel off, but a small price to pay for lower risk. Yesterday we took the bus to the seashore side of town to see an Easter Market. There were supposed to be dozens of booths and also animals to see. I pictured an enclosed mall with tents in the parking lot for the animals. Well, the mall was more of a strip-type street of shops, which is reasonable since it is good to be able to enjoy the fresh sea air and breezes while shopping. But on this day, it was raining. So there were only a handful of hardy souls huddled under awnings and umbrellas trying to sell their homemade goods, and no animals. I had hoped for chicks, bunnies and ponies. Maybe even a miniature donkey. But nothing, nada. Too bad. The day before had been unbelievably beautiful and we had very much enjoyed a walk through the Christchurch Botanical Gardens. Today is rather nice too. So I can't really complain. Most of the shops in the mall were closed. 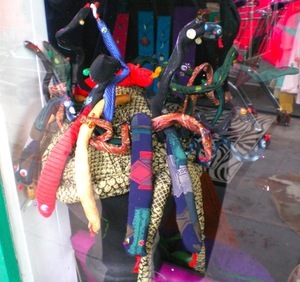 One closed second hand/antique store had this crazy snake hat in the window. Many of the snakes seemed to made from the narrow ends of men's ties. At first I thought it was a display of stuffed fabric snakes for sale, but upon closer inspection, I think they are all attached to a center hat form made of snake skin printed fabric. A Medusa's head hat. Pretty cool.